The accusations continue between Blac Chyna and the Kardashians. The 29-year-old social media maven said that the first family of reality TV threatened to pull Keeping Up With The Kardashians from the E! network in a power play to call the shots on the fate of her show, Rob & Chyna. Chyna, whose real name is Angela Renée White, levied the accusations in court documents, TMZ reported, in her ongoing claim that Rob, Kim Kardashian and Kris Jenner sabotaged their 2016 show amid her messy split with the sock designer. The Washington D.C. native told the court she was not kept in the loop in regards to why decisions were being made. The salon owner said that the first season got such great ratings - even better than Keeping Up With The Kardashians - that filming had begun on the second season of the show, according to the outlet. Chyna pointed to a January 2017 meeting that took place with the Kardashians and E! brass as the flash-point of the maneuverings that led to the show coming off the air. She said that false claims the family was making that she was abusing Rob was also a factor, according to the outlet. Chyna has requested the court ask for documentation from the Kardashians and E! in regards what happened to with her show. 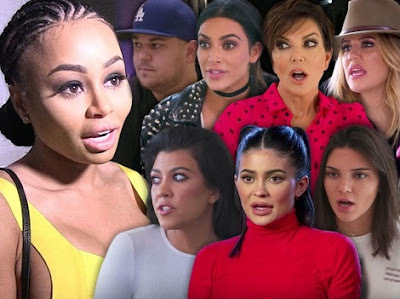 The Kardashians have cited low ratings, as well as a restraining order filed by Chyna against Rob last summer, as the explanation for the show's cancellation. Chyna had past said the family had no reservations 'about using their fame, wealth and power to take you down, including getting your television show cancelled ... and spreading lies about you,' TMZ reported in January.